Bulk & Specialty Chemicals « Global Market Insights, Inc. In an era where ecological competence has gained a pivotal importance in construction sphere, waterproofing membranes market is set to emerge as one of the most opportunistic business spheres of polymers and advanced materials industry. Pertaining to the growing concerns over environmental degradation and resource limitation, green roofs of late, are claimed to be the most widespread preference in the construction community. Needless to say, waterproofing membranes are absolutely critical for establishing these types of green roofs. While some are intrinsically impervious, most of these roofs require some kind of treatment to prohibit any kind of water leakage into the building. 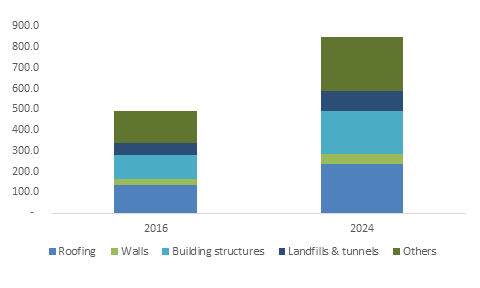 Indeed, the inevitable requirement of maintaining building sustainability has provided a significant impetus to global waterproofing membranes market trends. However, it is prudent to mention that in spite of the growing number of policies implemented by emerging economies with regards to building energy performance, the average energy consumption per person in the building sector practically remained unchanged over the past few years. As a matter of fact, global building related carbon dioxide emission has continued to rise by 1% since 2010. Amidst this slightly distressing scenario, waterproofing membranes industry is sending out waves of anticipation, on grounds of its contribution in reducing the environmental concerns. IEA’s latest report claims that low carbon energy efficient building technologies can ultimately lead to improvement in global energy utilization per capita by at least 10% by 2025. Regionally, China has emerged to be one of the profitable growth avenues for waterproof membrane market, primarily on account of the increasing infrastructural development and industrialization in the country. The growing infrastructural activities, in consequence, has tremendously upscaled the energy consumption in the China’s building sector, which by extension has generated a massive demand for waterproofing membranes in the region. Statistics indicate that energy consumption of buildings in China accounts for nearly 15% to 16% of the total energy consumption of the nation. To speak of the product landscape, bitumen membranes, as it is observed, have been gaining a sheer popularity in China market for roofing applications, subject to its excellent adhesion properties and favorable regional governmental norms. As per estimates, China bitumen waterproofing membranes industry share from roofing applications is set to exceed USD 250 million by 2024. Companies partaking in this moderately consolidated business space are deemed to witness lucrative opportunities over the ensuing years, given the rising preference of green buildings both across developing as well as developed nations. In the face of intense share battle, waterproofing membranes market players have been increasingly joining forces with one another to come up with innovative solutions, in a bid to substantiate their position. Recently for instance, BASF, one of the leading waterproofing membranes market giants, collaborated with SoloPower Systems, to launch a multi-layered seamless roofing system that would act as an interface between the environment and building. Reportedly, this highly enhanced multi-layered water proofing membrane holds considerable opportunities for cost effective energy saving in buildings. This breakthrough system, as per reliable sources is comparatively 60% lighter than the conventional roofs, subject to its unique architecture. Backed by a slew of advantages with regards to energy efficiency and environmental viability, this groundbreaking roofing system plausibly would bring a disruption in the waterproofing membranes industry. While speaking of the market’s potential opportunities, it is also imperative to mention that the business space is subject to a string of constraints, fluctuating price trends of raw materials being at the pinnacle. The primary feedstocks for manufacturing these waterproofing membranes are bitumen and polypropylene. As these materials are mostly petroleum based, volatile crude oil price trends leave a somewhat deterring impact on waterproofing membranes industry outlook, in terms of overall production cost. Nonetheless, with regional players making significant investments in product differentiation, both in terms of quality and cost, the industry is forecast to witness appreciable growth over the ensuing years. In terms of commercialization, the overall waterproofing membranes market would exceed a valuation of USD 10.5 billion by 2024. This entry was posted in Polymers and Advanced Materials and tagged APAC Waterproofing Membranes Market, Europe Waterproofing Membranes Market, Liquid Applied Membranes, Roofing waterproofing, Sheet Membranes, USA Waterproofing Membranes Market, Walls waterproofing membranes market, Waterproofing membrane market, Waterproofing Membranes Industry, Waterproofing Membranes Industry Analysis, Waterproofing Membranes Market, Waterproofing Membranes Market 2018, Waterproofing Membranes Market 2024, Waterproofing Membranes Market application, Waterproofing Membranes Market forecast, Waterproofing Membranes Market growth, waterproofing membranes market regional analysis, Waterproofing Membranes Market report, Waterproofing Membranes Market share, Waterproofing Membranes Market size, Waterproofing Membranes Market trends. Global fluorochemicals market is one of the most opportunistic yet debatable business spheres of recent times. The trend is driven by the product being a subject of questions by regulatory authorities on grounds of its environmental viability. The United States EPA is taking significant measures to limit four PFASs (poly and perfluorinated alkyl compounds) that are responsible for contaminating drinking water in at least twenty states across the nation. The move marks a remarkable influence of the regulatory framework in swaying the fluorochemicals industry trends. A major shift in the competitive landscape of fluorochemicals market is underway with renowned biggies joining forces to come up with solutions that are in sync with the sustainability trends. Chemours’ strategic tie up with Arkema bears a testimony to the aforementioned declaration. Reportedly, the American fluorochemical industry giant has signed an agreement with Arkema for distributing XP40 in the European Union to address the growing GWP (global warming potential) refrigerants demand under the F-gas regulation. Not to mention, refrigerant applications contribute a chunk to the global fluorochemicals market share and is anticipated to exceed USD 30 billion by 2024. For the record, Opteon™ XP40 by the Chemours Company is presently the most preferred choice among retailers, contractors, supermarkets, and distributors across the European belt, on account of its improved performance and sustainable environmental footprint. In fact, statistics depict that XP40 features nearly 65% reduction in GWP as compared to its contemporaries. With this agreement, the company is planning to expand the access of this breakthrough product across Europe fluorochemicals industry, which is expected to register 3% CAGR over 2018-2024. 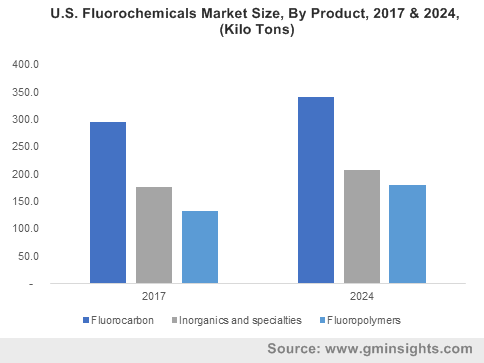 The growth spectrum of fluorochemicals market can also be credited to a rich product landscape comprising fluoropolymers, fluorocarbons, and inorganics & specialties. Grounding on estimation put forth by Global Market Insights, Inc., that claims fluoropolymers market size to reach USD 9 billion by 2024, it would not be incorrect to state that fluorochemicals market is set to gain tremendous remuneration opportunities from this vertical. Endowed with a barrage of unique features like high base resistance, non-adhesiveness, and superior electric properties, fluoropolymer applications span across semiconductor, aircraft, automotive, and domestic sectors. It is imperative to mention that global fluorochemicals market has been experiencing a flux since a while now. High price trends of fluorocarbons subject to its phase out polices in parallel to its increased demand is somewhat creating a disproportion in the supply demand curve. In tandem, the dominance of stringent regulatory structure and the subsequent high compliance cost is also influencing the competitive terrain. In the face of this relentless regulatory pressure, established fluorochemicals industry giants, it has been observed, have been striving hard to bring technological advancements in the manufacturing processes with mergers & acquisitions as one of the most prevalent growth tactics. The global fraternity is anticipated to record lucrative proceeds in emerging economies in the ensuing years, backed by the massive expansion of automotive and construction sectors. In fact, APAC, driven by India and China is projected to exceed a demand of 2.5 million tons by 2024. India alone is expected to surpass a revenue of USD 3 billion by 2024, with proliferating automotive and aluminum production bagging the growth credits. All in all, with a rich product and application spectrum, the worldwide fluorochemicals market size is expected to register phenomenal growth in the coming years, surpassing a revenue of USD 70 billion by 2024. This entry was posted in Bulk & Specialty Chemicals and tagged Aluminum Production, Blowing Agent, Components, Fluorocarbon, Fluorochemical Market, Fluorochemicals market, Fluorochemicals market size, Fluoropolymer, Global Fluorochemicals Market, HCFC, HFC, HFO, Inorganics, Refrigerant, Specialties. Polyurea market size is forecast to register surge at a CAGR of 4.8% and reach 249.6 kilo tons from 2015 to 2022, according to the new research by Global Market Insights. The report provides 7 year market projections with important analytical and statistical information on the global developments, technology shifts, industry structure, applications, market shares, key market players, industry dynamics, and critical market trends. An in-depth analysis of the global polyurea market. Analysis of global market trends, with data from15, forecasts for 2016, and projections of CAGRs through 2022. Exploring the latest trends and new technological advancements in the market. Profiles of key market participants. The polymer is obtained by the reaction of isocyanate compounds and synthetic resin polymer, through the technique of step-growth polymerization. It has distinctive properties like pigment compatibility, fast set-time, thermal stability, highly crack resistant, and superior water sensitivity. It is processed to manufacture adhesives, lining systems, sealants and coatings and is widely used in numerous applications including construction, transportation, and industrial etc. Finer advantages of this polymer like excellent elongation, long lasting, etc. over other substitutes like polyurethane and epoxy is anticipated to propel the industry. Growing investments in infrastructure expenditure are projected to boost polyurea market growth during the anticipated time frame. Furthermore, the favorable market price trend is poised to open avenues for niche applications and innovation. Increasing environmental safety measures, strict regulations for environmental pollution is likely to impel market trend in the near future. Aromatic market size is anticipated to register highest gains by 2022. Aliphatic raw materials are likely to witness moderate growth at a projected CAGR of over 4% during the estimated time frame. Lining product is poised to observe growth at a projected CAGR of over 4% during the predicted period. The report covers the in-depth analysis of the market on a regional scale. Asia Pacific polyurea market is likely to continue its dominance and register highest gains over the next few years owing to the proliferation of protective coatings in industrial and automotive applications especially in China and India. The U.S. market share is anticipated to exhibit moderate growth at a projected CAGR of over 4% by 2022. The report features competitive landscape, business strategies and key trends of the market with profiles of key participants in global polyurea industry. Key players in the industry include Huntsman Corporation, PPG Industries, Bayer MaterialScience (Covestro), Specialty Products Inc., and BASF. This entry was posted in Polymers and Advanced Materials and tagged Aromatic polyurea market size, Coating, Lining, Polyurea Market, Polyurea Market Size, Sealants. The market size of specialty fuel additives market is anticipated to cross USD 10.4 billion till 2023, with a CAGR of 6.8% between the years 2016 to 2023 as per the study done by Global Market Insights. These additives are chemical formulations which enhance the preferred properties of the fuel. Emphasis on bio fuel will work as a driving force for the growth of this market. Worldwide consumption of ethanol was 297.91 million gallons in the year 2007, and touched 513.04 million gallons in the year 2011. Likewise, annual consumption of biodiesel was 63.77 million gallons in the year 2007 and reached 151.18 million gallons by 2011. Emergence of standards for controlling emissions especially in countries like U.S., China, and EU, will propel specialty fuel additives trend which is projected to touch 2,482 kilo tons till 2023. Possibility of getting a good upsurge in this market is high as the world is looking for substitute of LPG and CNG and these additives can act as best replacements. Size of deposit control additives market is anticipated to touch 3,829 kilo tones till 2023 with a CAGR of 6.4%. These controllers are employed in various types of fuels and are used to restrict formation of deposit on injectors. Cetane improvers (CI) are mixed with fuels for improving their Cetane number, thereby accelerating performance. It is projected that the market of Cetane will cross 975 million till 2023. Along with Cetane and Deposit control, cold flow improvers will take a giant leap in specialty fuel additives market share. It is expected to have 8% growth in volume and more than 7.5% of overall consumption of volume till 2023. Gasoline additives are expected to touch 1,100 kilo tones till 2023. Diesel is heavier than gasoline, and releases poisonous gases in the environment, thus everyone’s attention is moving towards fuel additives market. Countries like India, China, Indonesia, Pakistan and Thailand have greatest consumption of diesel and owing to its toxic emission specialty fuel additives market are gaining high demand and are growing at a CAGR of 6.7% till 2023. Let’s take a look on some of the highlighting figures of fuel additives market. U.S. market is predominantly captured by gasoline and is anticipated to touch 2.5 billion till 2023. Europe market size was USD 1.58 billion in the year 2015 and is likely to rise with a CAGR of 5.9% in near future. Middle East market will go beyond 1.3 billion till 2023. This entry was posted in Bulk & Specialty Chemicals and tagged Antioxidants, Cetane Improvers, Cold flow Improvers, Corrosion Inhibitors, Deposit Control Additives, Fuel Additives, Global specialty fuel additives market share, Lubricity Improvers, Specialty Fuel, Specialty Fuel Additives Market size. According to a new study based report by Global Market Insights, gold nanoparticles Market size is projected to be worth USD 8 billion by 2022. Advancement in Nanotechnology, furthered by investments in R&D, coupled with proliferation of this technology in medical and diagnostics sectors is expected to have a positive impact on the market size. The report analyzes gold nanoparticles market on the basis applications, regions, current market trends and key market players. The report is a comprehensive analysis of current market trends and offers market projections for the anticipate time frame. It analyzes recent advancements in nano technology along with top industry participants profiled in the report. In addition to this, it comprises of a review of macro and micro factors vital for the current market participants and new companies. The report offers analysis for competitive dynamics. Gold nanoparticles market size is projected to surpass 20,000 kilos during the projected time frame with gains over 23%. Escalating demand for precision storage devices as well as flash drives, micro SD, DLNA devices, is likely to impact the industry positively. Medical sector and dentistry dominated application segment for the market during the last few years. Proliferation of nano technology demand in photo imaging, diagnostics and therapeutics is likely to boost the market growth in coming few years. Increasing investments in R&D activities is projected to open new avenues in healthcare and pharmaceutical industry in near future. Electronic industry is the second largest and rapidly growing application in the market. The market in electronic application is likely to be worth USD 1.9 billion during the forecast period. Growing use of compact devices is anticipated to propel the market growth. U.S. is accounted for the largest global and regional consumption market share and is anticipated to hit USD 2.2 billion during the forecast period. Asia Pacific, specifically China and India market size is likely to observe the significant gains and exceed USD 2.9 billion by 2022. Europe gold nanoparticles market share is projected to witness moderate growth and hit USD 1.3 billion over the anticipated time frame. NanoSphere, BBI Solutions, Sigma Aldrich, Nanostellar, Cytodiagnostics, Johnson Matthey, and Metalor are some of the key players in highly competitive Gold nanoparticles market. Factors like application development, cost competency and product innovation are likely to be crucial for business success. This entry was posted in Polymers and Advanced Materials. Global market Insights Inc. has announced an addition of a new study based report on intumescent coatings market to their offering. According to the report the market size is expected to reach 145.6 kilotons by 2022, at a growing CAGR of over 5%. The report covers in-depth analysis of the market on the basis of applications, geography and competitive scenario. It focuses on potential aspects such as drivers, impediments, opportunities, and challenges that influence the market scenario. It begins with an overview of the market including, definition, classification, application, etc. It then analyzes the market on the basis of segmentation at a regional level coupled with price rate, profit, forecast and estimates. It also discusses competitive landscape of the market along with top participants in the market, company profiles, key business strategies and financial metrics. The industry is likely to experience significant growth over the projected time frame. This growth is attributed to wide reaching use in automotive and construction applications. Furthermore, escalating demand for fire protection in construction, oil & gas, and steel sectors is anticipated to impel intumescent coatings industry growth. In addition to this, properties including aesthetic appeal and durability make them a preferred option in construction and automotive application. Growing demand of Cellulosic coatings in automotive segment is likely to influence the global market positively owing to its multiple features. The oil and gas industry is likely to continue its dominance in the end use segment with revenue forecast surpassing USD 588 million in thenext six years. Strict regulations to maximize human safety by implementing fire protection systems in buildings and increasing awareness about safety is anticipated to further demand, projected at more than 57 kilotons during the forecast time frame. Asia Pacific is the largest regional market in the industry. Increasing industrialization, together with growing construction activities mainly in Vietnam, India and Bangladesh is poised to boost regional consumption. Asia Pacific is likely to continue its dominance, owing to strong infrastructure expenditure. Furthermore, rising industrialization and growing awareness about fire safety is anticipated to witness a drive in use during the projected period. U.S. intumescent coatings market share is likely to hit USD 143.7 million in next six years with prospective opportunity from the aerospace industry. Furthermore, LATAM and MEA are expected to propose noteworthy potential opportunity for industry participants during the projected time frame. The report lists key participants in the industry, including Jotun, Sherwin-Williams, Akzo Nobel, Carboline, and Hempel. This entry was posted in Bulk & Specialty Chemicals and tagged Cellulosic, Coatings Market Size, Epoxy resin market, fire protection fire protection, Hydrocarbons, Intumescent Coatings Market, Intumescent Coatings Market Size.